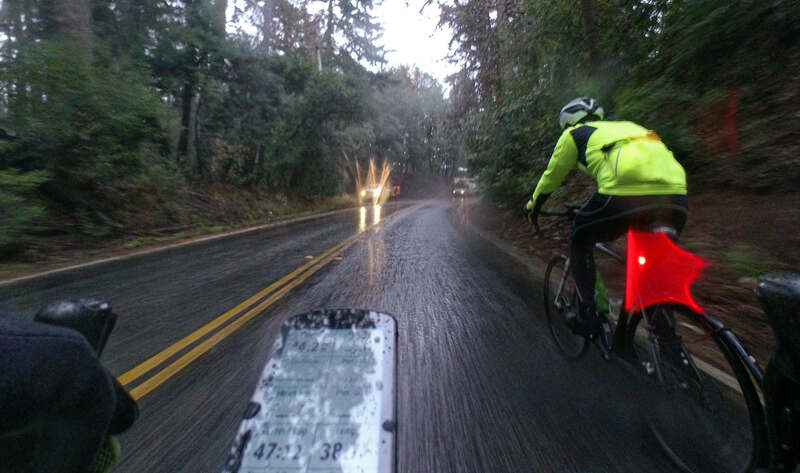 We’ll give the first “real” winter rain ride a B. Good effort. It’s 38.7 degrees, it’s raining, and you’re up on Skyline getting ready for a long descent home. What’s not to like? Sure, it would have been nicer to wake up to a roaring downpour with the wind driving the rain against the bedroom windows, but maybe that’s being saved for Thursday. Today we had light rain and pretty cold but not quite nastily so. Of course nobody showed up, just myself and Kevin. No records broken, either fast or slow. Easy 37 minute ride to the top and the chance to actually talk a bit on the way up. Kevin started out pretty slowly (apparently didn’t sleep well) but picked up the pace as we headed up the hill. NOBODY out there. No cyclists I mean. A few cars, one runner. Actually we did see someone commuting north on Canada Road at the start; curiously not someone we’d seen before (on an older blue LeMond bike). Not on Strava either. It was about 42 at the start, dropping gradually as we climbed Kings, bottoming out around Skeggs at 37 degrees. Had it been raining really hard, that might not have been too comfortable; anything below 40 in a really soaking rain is generally not a lot of fun. But this was light rain and not an issue. Still, it was more fun on the flats and climbs than on the descents. Thursday should be more fun. Forecast is for a steady rain, moderate winds. We’ll be ready.